These 6 teams had plenty of energy to play and still had energy to spare. They have an excitement for the NACBAIT that you just can't teach. No matter the reason, the Boys Juniors Tournament gave us the flashiest and most fan friendly games of the Tournament. When the Semis came, it was CCYAA 18 v/s CYC 18, and USAB 18 v/s Young Life Rockits. The battle of the C's was a lopsided victory for the T Dot. Kenny Ho did it in the first half, as CCYAA was crushing em 33-7. In the second half, Steven Jung picked up his teammate's scoring slack to lead CCYAA to a 55-36 win. The next game was NY-NY. These 2 teams have a very intense rivalry, and this time USAB got the best of the Rockits. Nick Miu and Michael Pan did a number of the Rockits, who just could not get their game going. USAB won 47-36. The Championship game was quite a high scoring affair. 36-25 was the tally at the half in USAB's favor. Toronto's guards could not hang with the speedy USAB Backcourt and the athletic forwards that USAB put on the court. 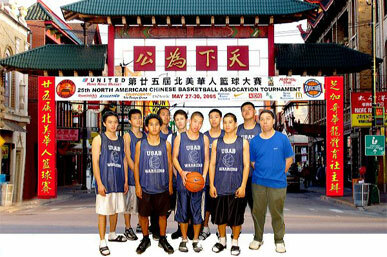 USAB continued their onslaught as they won this year's NACBAIT 74-59. Great job Bill Chan on finally getting it done!